Khachapuri is a crusty flat bread filled with cheese from Georgia, and when I say Georgia I don’t mean the state where they grow peanuts and say y’all. Geography was so much easier when I was a kid. A huge chunk of the world was just referred to as the Soviet Union and that was that. I find myself having to look up locations more and more! Thank God for Google Earth, right? Anyway, Georgia is situated between Russia and Turkey and it’s traditional foods reflect both Asian and Greek Influences. Khachapuri has a chewy crust similar to pizza but is filled with cheese and often topped with an egg toward the end of baking. Since the cheese traditionally used isn’t available here I’ve taken a teensy liberty and replaced it with a combination of smooth, creamy Muenster and Smoked Gouda. The traditional cheeses that are used are generally more like Feta, with a salty-briny taste. Muenster with Feta would be a close match. The yeast dough is divided. I suggest using a scale to get them even sizes. 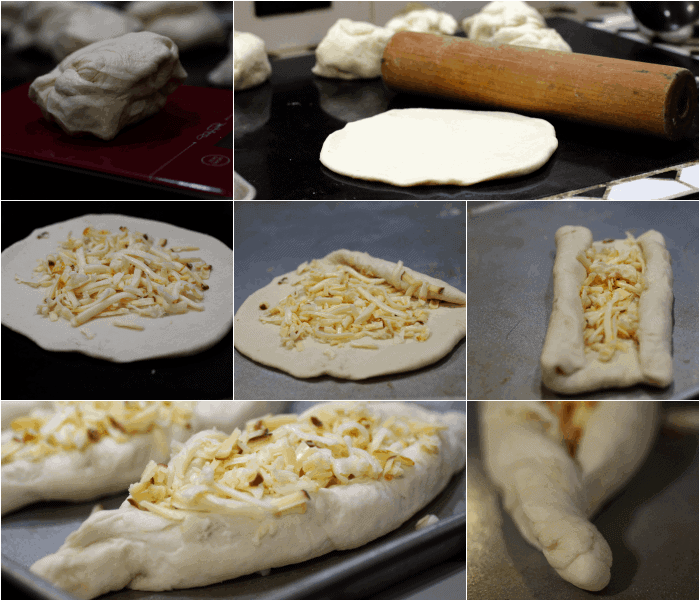 The dough is then rolled into large circles, spread with the cheese, and the sides are tightly rolled in toward the middle, leaving a two inch or so space in the center. The ends are pinched together and the loaf takes on a leaf shape. When it comes out of the oven it is piping hot with gooey cheese and chewy crust. Serve it with a salad or soup for a lunch or simple dinner. It doesn’t take a lot of time to make. The initial rising time is just 45 minutes and after it’s shaped it’s baked immediately. Start to finish this should only take you a little over an hour. Although I have not tried it, I suspect that you could freeze the shaped bread, baked or unbaked, without any problem. I adapted this Khachapuri recipe from Saveur. With the combination of cheeses that I use it tastes like a combination between pizza and the best grilled cheese you ever had. 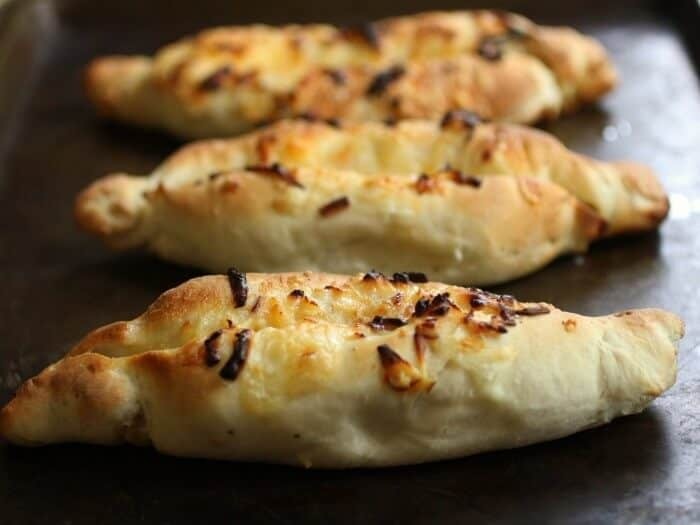 Something like a cross between pizza and the best grilled cheese you ever had, this Khachapuri recipe is super simple to make. It's a great lunch or simple dinner. You can freeze the shaped Khachapuri either baked or unbaked for up o three months. Combine the yeast, sugar, and water in the bowl o your mixer. Let stand for 10 minutes, or until foamy. Add the oil, flour, and salt, mixing on low speed until a soft dough forms. Knead on medium for 3 minutes by machine or 5 by hand. You want the dough to be smooth and elastic. Transfer it to an oiled bowl, oil the top and cover with a tea towel. Set in a warm spot to rise for 45 minutes, or until doubled in size. Punch the dough down and divide in six pieces. Roll each piece out into a circle about 1/.8-inch thick. Spread with 1/12th of the cheese. Tightly roll in one side of the dough about a third. Do the same with the other side, leaving a 2-inch space in the center. Pinch the ends together, creating a leaf shape. Twist to seal. Sprinkle 1/12 of the cheese in the center. 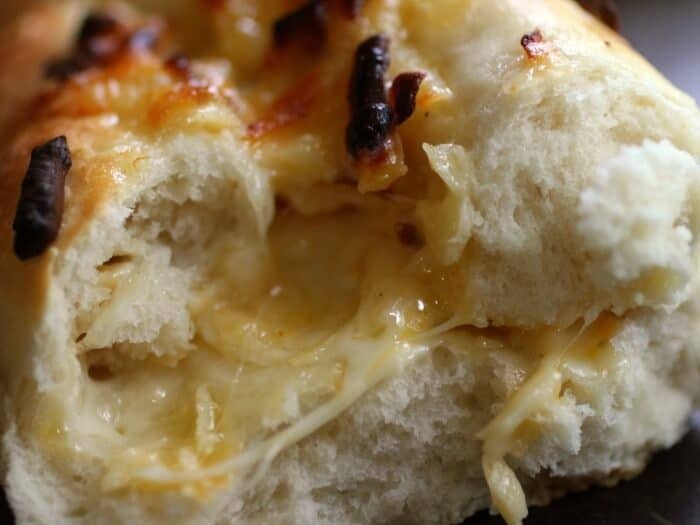 Bake for 10 to 12 minutes, or until cheese melts and crust is golden brown. Add a little of the butter to the open center of each bread while it is hot. I love Khachapuri – it’s in the Jerusalem cookbook so that was my first intro to it but in April we ate at the most wonderful Georgian restaurant in NYC. The khachapuri was amazing! I may give this a try. Another chance to get over my doughabphobia! Definitely! I love these. I should make them more than I do! In Indian cuisine, “khachapuri” means dry bread and it is also a famous recipe. Your bread looks so very delicious and I have to to try it. It’s really similar… but not. LOL, I totally thought the state and thought it just must be a local dish, you know like the Philly Cheese Steak of SF’s seafood stew cioppino. Regardless where it was from, it looks amazing. Is it wrong I want to dunk it in some sauce? LOL! I’ll admit the very first time I saw this I thought the same thing! Marye, I love this variation on an ethnic specialty. (Of course, when you say Georgia and I know it’s you talking, I immediately think of the state n, not the former Soviet Republic – but never mind:) ) Plus analogizing it to grilled cheese makes it so obvious that our favorite foods really know no borders. It’s true tho.. so many things are worldwide with a few changes. Bread. Cheese. You had me right there. These are like little cheese popovers, and by “popover” I mean “pop over to my mouth:! LOL These look like little bites of heaven. I would fail Geography now. Some much has changed and continues to change. Luckily I can still enjoy this gorgeous bread. LOL! I know… school was so much easier when countries stayed put! This bread looks insanely delicious! OMG this looks incredible! And perfect for this time of year. I’m sure it’s great with soup, stews, and even holidays. Yep. I think they are pretty addictive! Looks and sounds heavenly. 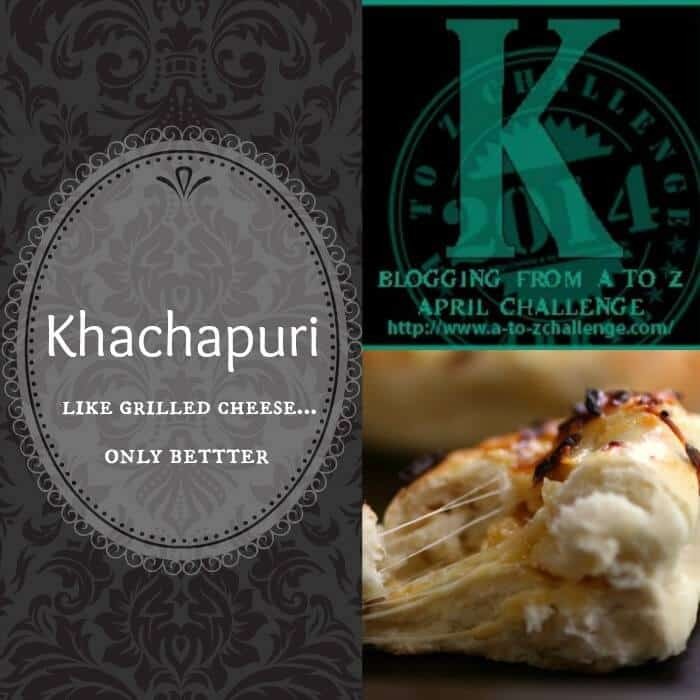 Khachapuri—now why hadn’t I heard of it before? In your Americanized version it could become the new craze! LOL! I don’t know about that but it was delicious. That does look delicious! Can’t really go wrong with Muenster or Gouda either!